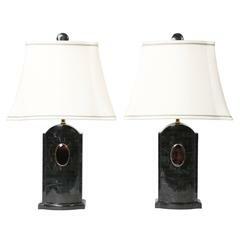 Excellent vintage condition with minor wear to stone but no major chips or cracks; brass has a warm, natural patina. Rectangular, four-leg box clad in lacquered, convex bone tiles. Hinged top with felt-lined interior. Remnants of a paper label. 1980s hinged box with gray suede lining by Karl Springer. Exterior is painted in maroon and speckled-yellow bands with gold accent stripes and black-painted ends. 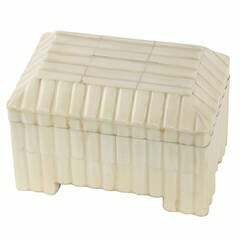 Circular, hand-carved box in a warm, creamy polished alabaster. Shiny brass trim on upper and lower edges. Hinged lid. "Made in Italy" sticker on underside. Square Maitland Smith tessellated stone box with hinged lid and brass inlay detail. USA, 1980s. Maitland-Smith tessellated box. Light pink stone tiles with red and brass banded detailing. Wooden interior. No makers mark. 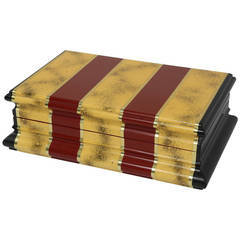 Tessellated black and brown marble box with black velvet felt interior by Maitland Smith.